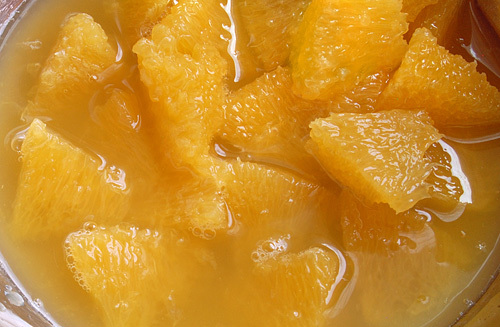 Welcome to Citrus Week here at Month of Sundries (otherwise known as: Five Ways to Make Your Kitchen Smell Awesome). 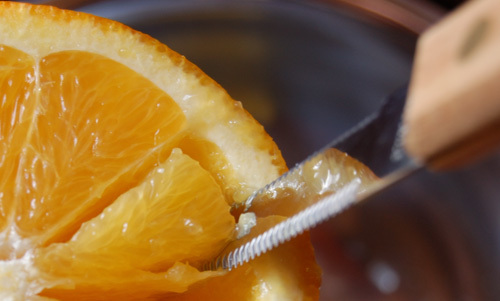 I almost always make candied orange and grapefruit peels to give as gifts this time of year, and—as you will soon see—there are a lot of interrelated activities that can go with that. First of all, before you even get to the peels, there are the (oh, so tasty) insides to deal with. 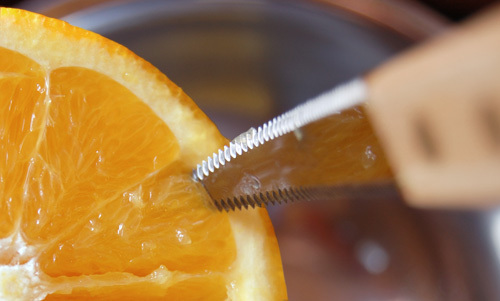 This can mean scooping out the fruits or squeezing them for juice. Today, we’re all about the scooping. There are lots of ways that one might use the citrus, once it’s been scooped out (or sectioned)—tarts, salads, salsas, or even adding a fruity kick to a savory main course. But my favorite way to enjoy it is as a simple but delicious fruit cocktail—just stirred up with its own juice and a little sugar. Scooped citrus is something that I associate especially with holiday breakfasts, but I often make it during the winter months. 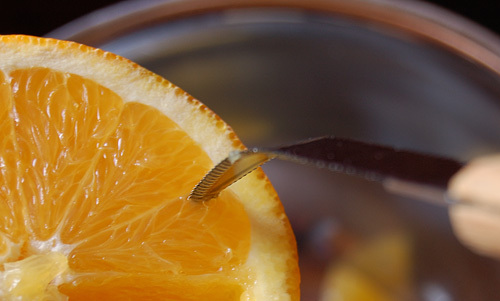 There’s something wonderfully decadent about enjoying citrus that has already had all the work done, even if I was the one who did all the work! 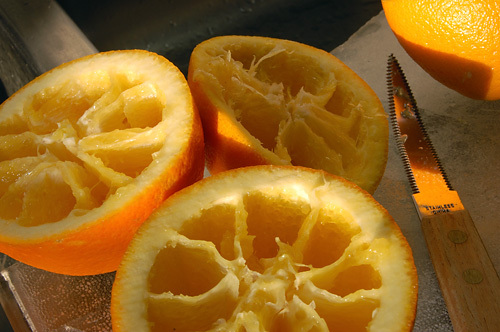 There are other ways to section citrus, but this is my method of choice, and once you get the hang of it, it’s fast and easy. 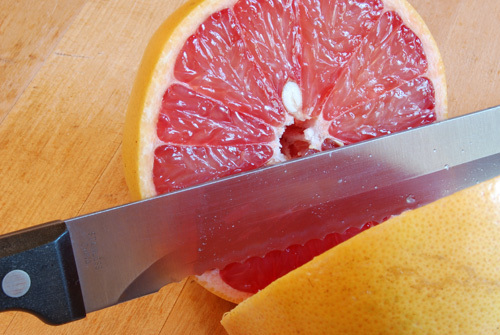 The only drawback is that it requires a special tool—the grapefruit knife—but that doesn’t take up much space in the drawer, and I’ve gotten a lot of use out of it. 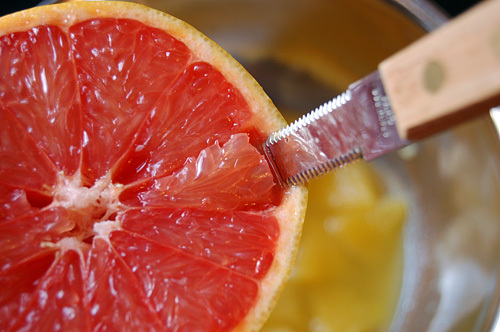 A grapefruit knife is a specially shaped knife with a dual serrated edge and a bend or curve near the tip, designed to work within the curves of the fruit. The first thing you will need to do is thoroughly wash the fruit (remember, we’re going to be wanting those peels later). Once they’re scrubbed and ready, cut them in half across the middle (in other words, if you consider the two end nubs as the poles, you’re going to cut through the equator). 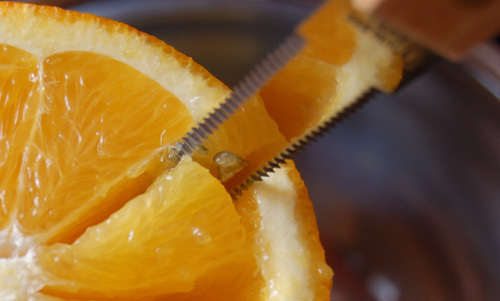 Then, using minimal pressure (let the knife do the work), slide the end of the knife in along the membrane until it encounters the resistance of the shell. Make sure to keep your fingers away from the place where the knife is working, in case it breaks through the skin. Rock the knife in toward the center, running it along the membrane. I find it easiest to free the side that I’m working from first; that way, the section is still being held in place by the rest of the sides that are attached. Then, when you move to free the next membrane, it will be held by the fruit on the other side (until the last section, at least). 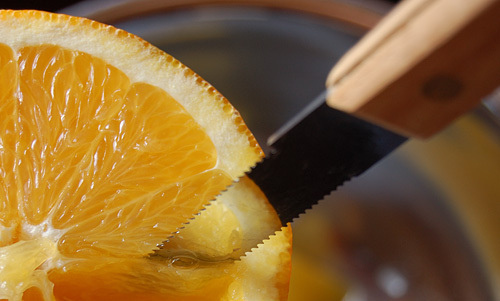 The section should now be free; use the knife to lift it out and let it drop into the bowl. 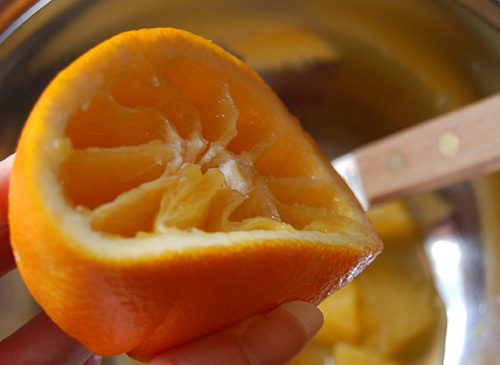 Tip the fruit to let any excess juice run out into the bowl, give it a slight turn to keep your fingers away from the next section you will be working on, and continue around with the knife until all the sections are removed. 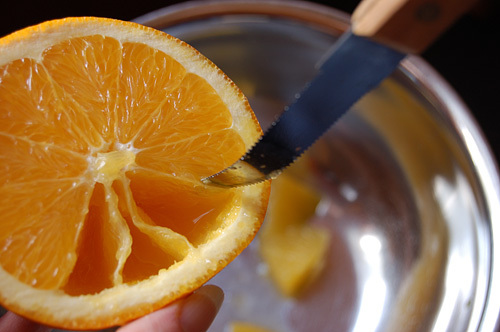 Once the shell is empty, squeeze it over the bowl to get the remaining juice. Don’t apply too much pressure, though, or you will extract bitter flavors along with the sweet juice. 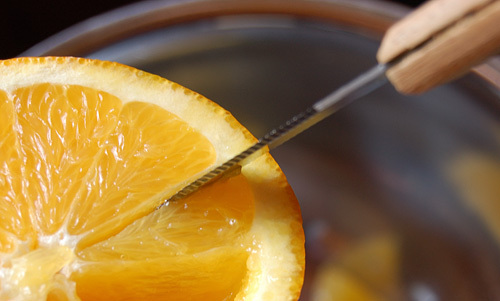 Just follow the same procedure for as many citrus as you want scooped out; the technique is the same—you can even section limes this way (I like tart, so I sometimes add a lime to the mix). 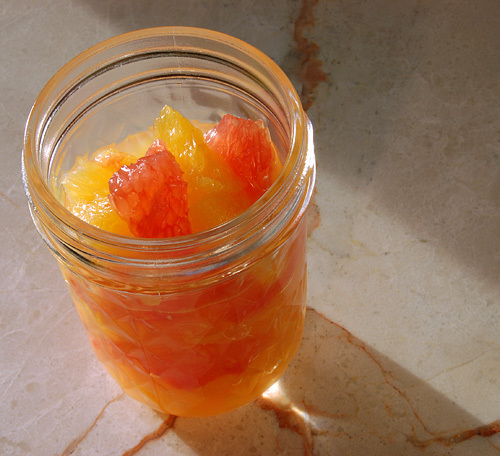 Once you have sectioned all the fruit that you want (for a breakfast citrus mélange, I use a ratio of around one grapefruit to three oranges), stir it up with sugar to taste (I used 1/4 cup for two grapefruits and seven oranges), and enjoy. This keeps well in the refrigerator, so if you’re wanting to serve it for a holiday breakfast, it works fine to scoop it the night before. The peels can also be stored in the fridge for a couple days, if you’re not quite ready to use them. Don’t worry, those peels will get some attention tomorrow.